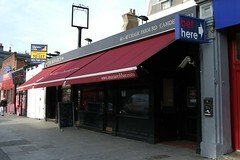 Large pub and gig venue in Camden, on Chalk Farm Road. Not to be confused with the old Monarch (now the Barfly) a couple of doors down the road, this building used to house the Man In The Moon branch of Wetherspoon's in the late-1990s and early-2000s. It can get extremely busy in the late evening, but for a post-work pint it's actually quite civilised compared to similar establishments in the area. The front third of the pub is often transformed into a small stage for bands and DJs, with enough room to dance in front of it. The middle third of the room (down a couple of steps) has a pool table, with more seating there and in the back third (which is back up the steps again). At the back there is access to a sheltered beer garden (down a large step), with several tables and benches for smokers. Thanks to some strategic partitions, it is possible to hear yourself think in this back section even if there is a gig going on at the front. Kat has visited on several occasions; there has usually been at least three handpumps available for real ale (all under £4/pint as of May 2014), with a couple of Shepherd Neame beers. There is also a decent range of keg beers and American bottled beers in the fridge. A chalkboard to the side of the bar lists all the available beers on pump and keg, with their prices. A basic pub menu is served all day (until 8pm on Sundays). As of 2014 there are also semi-regular quiz nights held on Mondays (booking recommended). Kat can confirm that the Twin Peaks themed quiz was fairly difficult. Accessibility: Toilets are up a flight of stairs. The website states that the management are happy to make alternative accessibility arrangements with a few days' notice. Last visited by Kat in May 2014. Opening hours taken from the Monarch website, May 2014. Last edited 2014-05-13 11:56:58 (version 3; diff). List all versions. Page last edited 2014-05-13 11:56:58 (version 3).